ATV Renegades Xbox One *New! *Factory Sealed! *Free Shipping! Product Details. Part #: ATV-RENEGADES-X1-N. UPC: 865810000257. Platform: Microsoft Xbox One. Product Details. Part #: ATV-RENEGADES-P4-N. UPC: 865810000240. Platform: Sony PlayStation 4. ATV Renegades - Xbox One. Compete against a friend in any unlocked event! Compete against a friend in any unlocked event! I will get back to you within 24 hours. ATV Renegades - Xbox One - Brand New - Factory Sealed!! 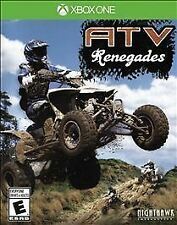 ATV Renegades - Xbox One - Brand New - Factory Sealed!!. Condition is Brand New. Shipped with USPS First Class Package. Trending at C $30.58eBay determines this price through a machine-learned model of the product's sale prices within the last 90 days. ATV Renegades. This is a previously owned item in used condition. Rated E - Everyone. 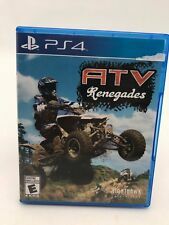 ATV Renegades (PS4) Sony PlayStation 4 Game. Condition is Very Good, the disc has no scratches. Free shipping to US. Paypal only. Thank you!